This bacon wrapped maple baked cornish game hen recipe is an easy dinner that only has three ingredients! Easy and delicious, this cornish hen recipe is guaranteed to become a family favorite! Are you still wondering what to make for your holiday dinner? 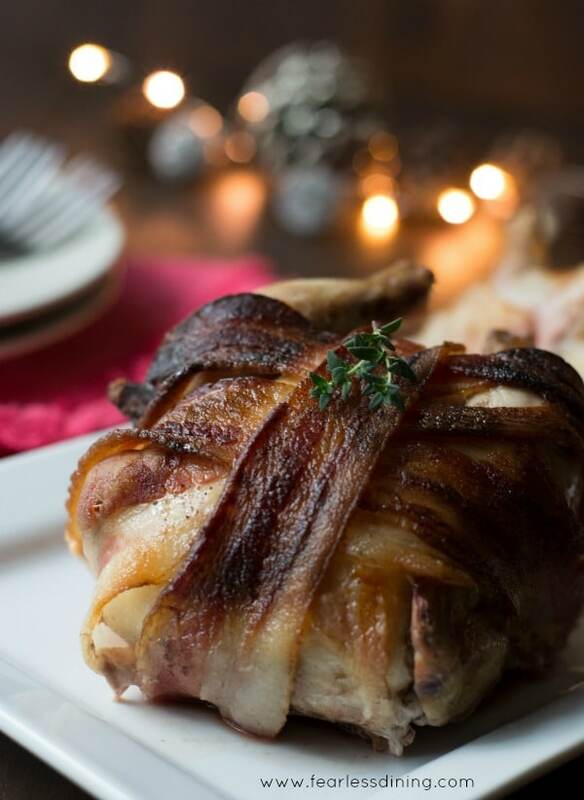 There are many recipes for Cornish game hens, but this one is wrapped in bacon, making it hard to resist. A Cornish game hen is a hybrid of a chicken that is a lot smaller! These birds are sold whole, in most grocery stores. Our family is enjoying our first experience with cornish game hens. Have you tried baking one of these hens yet? They look like teeny tiny little chickens and they have just enough meat to fill up one adult, or one very hungry growing teenager! Three simple ingredients; bacon, maple syrup, and Cornish game hens. It won’t get much easier than this. 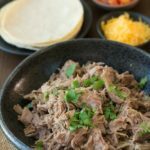 If you are entertaining for the holidays or looking for an easy dinner recipe, this recipe is for you. My teens’ reactions were actually quite funny. I could hear their desk chairs move. Then doors opened…and sprinted downstairs. They were so excited to try a Cornish game hen. My son, the die-hard carnivore ate a whole hen by himself! 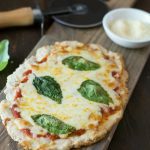 I hope that you love this recipe as much as my family did :-). Marinate the hen and cook it on the grill. Stuff the hen with fresh oranges and stuffing and bake it! Cook it in a slow cooker with fresh vegetables. If you have a smoker, try smoking your Cornish game hens. Smoking adds a rich flavor that penetrates the whole hen! What type of maple syrup is best to use in this game hen recipe? Rub the cornish game hens with maple syrup. Grade B is best! Next, is wrapping these hens in bacon! 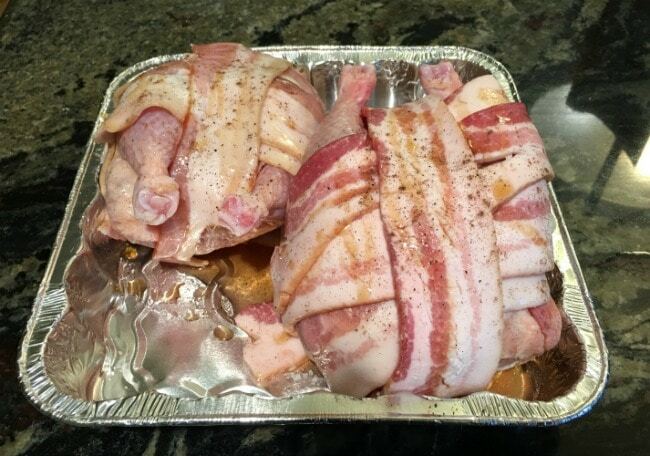 Wrap the hens in bacon and bake. How long do you bake your Cornish game hens? If your hens are completely thawed out, you can bake these for an hour. Cornish game hen’s cook time is very similar to chicken. Make sure the internal temperature is 165 degrees when finished. 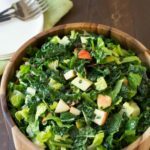 Check out all of the dinner recipes on this blog! A good pan to bake these Cornish game hens in. My very favorite meat thermometer. These bacon wrapped maple cornish game hens is a delicious dinner that is perfect for any occasion. Just three simple ingredients! Remove cornish game hens from wrapping. Place in a pan. Drizzle maple syrup over the chicken. Wrap the raw bacon around the hens. Sprinkle with salt and pepper. Cover with foil and bake for 30 minutes. 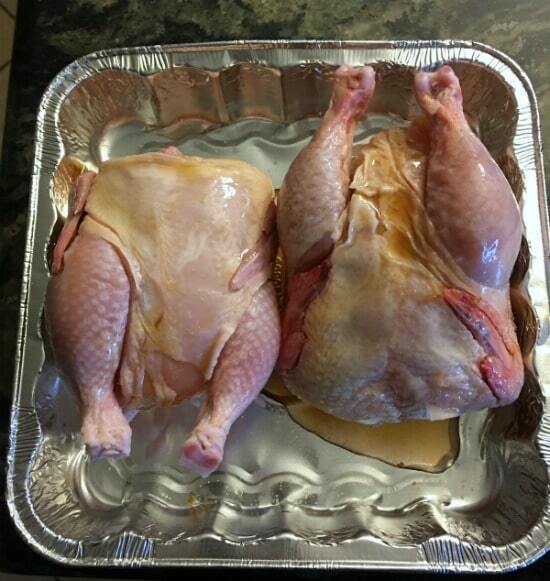 Remove foil and bake another 30 minutes, or until the cornish game hens reach 165 degrees internal temperature. 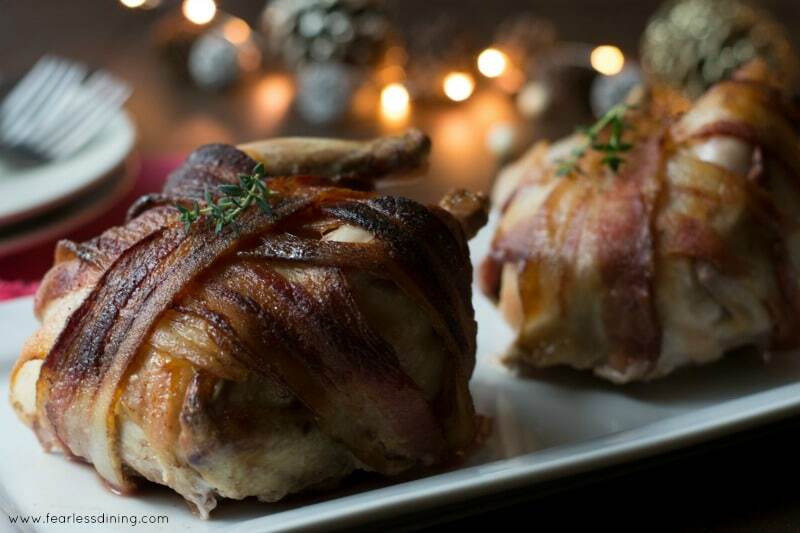 Mmm this bacon wrapped maple baked cornish game hen recipe looks awesome and so nourishing! Can I substitute Manuka Honey, for the maple syrup? Hi Alice, I have not used honey so I am not sure. Maple and bacon flavors impart in the recipe…and honey and maple are very different in their flavor profile. If you do try it, please do come back and let us know how it turned out. I tried this recipe for Thanksgiving 2018 and it was absolutely fabulous! It was delicious and turned out beautiful! Thank you for the recipe! I am SOOOO glad you liked this recipe Donna. It is one of our very favorites too. Thank you for coming back to let me know. Gorgeous pictures Sandi! They looked soooo good, I had to try and make bacon wrapped maple cornish game hens. I used your suggestion and used 8 slices of raw bacon. Thx for sharing! Wow!! This looks incredibly delicious. And This looks AMAZING! I will have to try it. These sound fantastic, wrapping anything in bacon makes it better, well almost better… That snickers bar did not work out too well.Thanks for reminding us to think of the people in the New york. Anything bacon wrapped is a winner with me and even better when it has maple syrup. Bacon definitely does make everything better! I love these little hens, they look so delicious and I love anything mini. I can’t describe why lol, I just like little things and think they’re cute! We’re definitely going to try these Cornish hens soon, my fiancé loves anything bacon wrapped! I’ve never tried a Cornish Hen and can’t buy them where I live. Love the idea of stuffing poultry with orange though – a fresh and unusual twist. You had me at bacon wrapped! Love this! Wow!! This looks incredibly delicious!!! I haven’t made a game hen in forever! this looks like the perfect recipe to introduce them to my boys! My husband will eat anything that’s wrapped in bacon! This is a perfect dinner for him! Bacon wrapped anything is sure to be amazing! These look incredible! I’ve never had cornish game hen before, but these look so festive and pretty for Christmas!